Davie, who prefers to be identified by his last name, says his usual winter outfit consists of two t-shirts, a sweatshirt, three coats, a pair of pants, basketball sneakers, two pairs of gloves, and two scarves. This is the first in an occasional semester-long series on homelessness in Harvard Square. The winter of 2013-2014 has not been an easy one for Harvard Square’s homeless population, but most winters are not. With nearly a foot of snow last week and more in the forecast, the weather has exacerbated existing shortages in space and resources at area shelters and placed added burdens on the population that spends most of its days on the street. 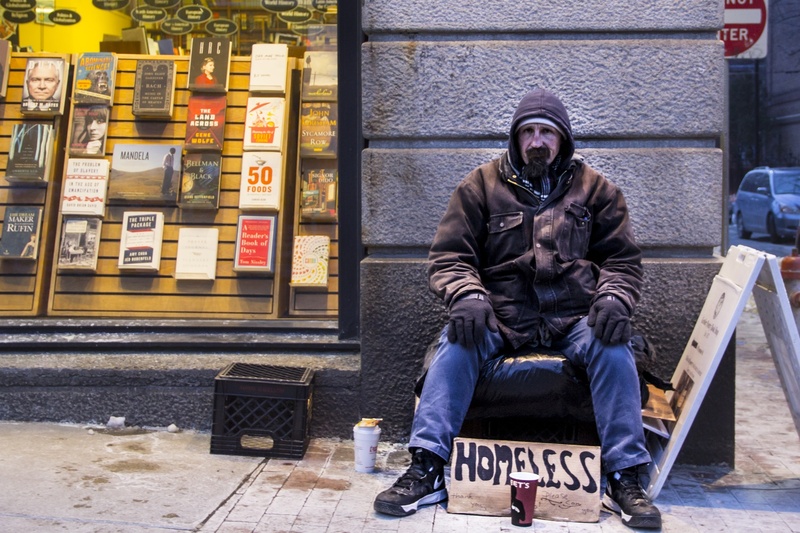 For these and others, who choose not to stay in shelters but in public spaces out of safety concerns, dangerous cold and precipitation can lead to health risks from pneumonia to frostbite. Gary Martin, a native Cantabrigian who has now been homeless for seven years, said that he and his life partner Whitney have passed most nights this winter sleeping in Winthrop Square, the small park enclosed by JFK, Winthrop, and Mt. Auburn streets. Davie is not alone in remaining outdoors. According to Mary Shannon Thomas, a social service worker specializing in homelessness cases, a significant portion of the Cambridge homeless population remains outside during severe cold spells and snowstorms. With most homeless shelters in Cambridge are at full capacity normally, Shannon said expansion is difficult during harsh weather. “Particularly in the winter, there’s always more need than there are beds,” she said.